NORRISTOWN, Pennsylvania -- Bill Cosby's lawyers on Wednesday attacked what they called "vague, remote and often inconsistent" allegations from a slew of women whom prosecutors are seeking to call as witnesses at his sexual assault trial next year. Cosby, who was known as America's Dad for his top-rated family sitcom, "The Cosby Show," which ran from 1984 to 1992, is charged with molesting a woman at his suburban Philadelphia home in 2004. Prosecutors are seeking testimony from the other accusers to show that Cosby had a long history of knocking out women with drugs and drinks and sexually assaulting them. At a hearing outside Philadelphia, the defense portrayed the potential prosecution witnesses as "bandwagon" accusers who came forward because they sought to cash in. The women went public at the urging of "clever, cunning lawyers who had the agenda of bringing down an American icon," Cosby lawyer Brian McMonagle told Montgomery County Judge Steven O'Neill, who must determine whether some or all of the accusers will be permitted to take the witness stand. McMonagle said prosecutors charged Cosby with attacking Andrea Constand just as the statute of limitations was about to expire as a way of digging deep into his past and dredging up ancient allegations. "This case has nothing to do with Andrea Constand," McMonagle argued. "This case was a way to try to vindicate what is a bandaged bandwagon of claims that have been put together in Pandora's box." The case began a decade ago when Constand, a Temple University employee, filed a police complaint against Cosby, a long-married father of five and her friend and mentor. A prosecutor at the time declined to file charges. Authorities reopened the investigation last year after scores of women raised similar accusations and after Cosby's damaging deposition testimony from Constand's lawsuit became public. O'Neill ruled last week that the deposition may be used at Cosby's criminal trial, arming prosecutors with Cosby's testimony about his affairs with young women, his use of quaaludes as a seduction tool and his version of the sexual encounter with Constand. 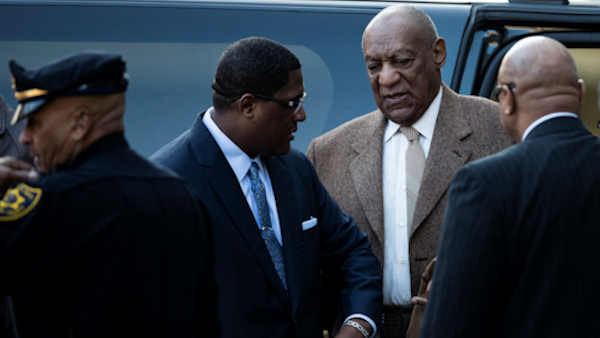 Cosby's attorney said Wednesday that Constand has offered shifting accounts of the encounter, making comparisons with the other accusers impossible. Under state law, prosecutors must demonstrate substantial similarities in the accusers' accounts to be able to call them to the witness stand. Prosecutors have argued that sexual assault victims often recall more details in subsequent interviews, and they say the discrepancies in Constand's accounts are not material to the case. The other women should be allowed to testify, District Attorney Kevin Steele argued earlier Wednesday, because their stories are so similar they show the "handiwork of the same perpetrator." Cosby befriended women who saw him as a mentor, knocked them out with pills and drinks and molested them, he said. "This is a lifetime of sexual assault on young women," Steele told O'Neill. Cosby's lawyers said the women's stories aren't similar enough to warrant their testimony. They pointed to differences in the location and manner of the alleged assaults, as well as the accusers' level of education and line of work. "You cannot ignore the differences," said another defense lawyer, Angela Agrusa. Allred, who attended Wednesday's hearing, has argued her clients have a duty to testify if the court wants to hear from them. She called the defense's dismissal of their accounts "out of context or just plain wrong."